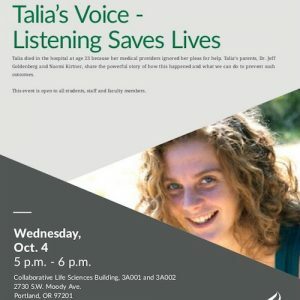 On October 4, 2017, Dr. Jeff Goldenberg and Naomi Kirtner (Talia’s Voice founders) will be giving two presentations at Oregon Health and Science University (OHSU), where they will have the opportunity to speak with both 1st and 2nd year medical students, as well as to residents and faculty. Talia’s artwork will also be on display at the medical school, which always deepens the experience for those who are hearing about Talia’s life and death. We look forward to engaging with a range of people involved in the medical community when we head to Portland in the fall. Wonderful to see your good, thorough, and heartfelt work–and Talia’s beautiful voice– going out into the world that desperately needs it. Thank you for coming to share Talia’s incredible story as well as your stories with us today. I know that moving forward with my medical training, I will always have Talia by my side. I can’t wait to hear more from you guys in the future. Please let me know if there is absolutely anything I can do to help spread the word.